“Ich bin Todojewski, das badende Kind mit dem Rettungsreifen auf der Birne! 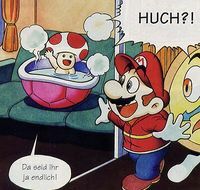 Todojewski is a Toad appearing only in the Club Nintendo comic, "Sag niemals Holerö!". His most striking feature is that he is always seen bathing in a Koopa shell (which seems to change, since at the beginning of the story it is red, whereas later it is green). Todojewski is first seen in a cabin on a train to Germany. Mario, TicToc and Bomberman are traveling there in order to solve the riddle of mysterious transformations taking place in Switzerland and Austria: all people turn into food. For reasons unknown, Todojewski knows why this happens and serves as an "adviser" in the story. When Mario and his friends stumble across him, despite not knowing each other, Todojewski salutes them by saying "There you are, finally!" and starts to explain the reasons of the happenings to the friends: An evil alien, disguised in human form and singing a song called "Holerö", is trying to invade earth. Whoever listens to the song turns into food. According to Todojewski, Mario, TicToc and Bomberman are the chosen ones to stop the alien. The Toad then gives the advice to go to Taj Mahal, and then vanishes into thin air. Later in the story, Mario and his friends find out about the alien's plan to serve the transformed humans to its evil alien fellows in the Alte Oper. Todojewski appears again, this time flying in his shell and bringing a suitcase with three black suits for the heroes. Those are way to large, and being asked what the suits are for, Todojewski replies that they serve no purpose but make the heroes "look somehow cooler". This page was last edited on October 21, 2018, at 21:33.